Education inspectors have found a high school requires improvements. 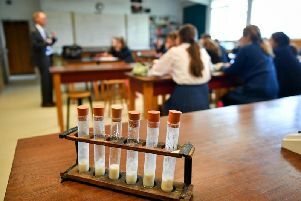 Ofsted ruled St Mary’s Catholic High School in Astley needed improvements in four of five areas inspected. Only the 16 to 19 study programmes were rated as good. The school’s overall rating in its last visit was also “requires improvement”. The team of inspectors found pupils did not make enough progress in maths, with the attainment and progress of pupils at the end of year 11 in 2016 below that of other pupils nationally. Disadvantaged pupils also did not make enough progress in maths, as well as science and humanities subjects. However, leaders had taken action to address the standards in maths and pupils were beginning to make better progress. Ofsted’s report said school managers did not analyse pupils’ attainment and progress well enough, so teachers did not receive enough information to help them plan and governors did not have a precise view of how well pupils were progressing. The report said: “Governors are experienced and share a commitment to bring improvements to the school. They said leaders had not ensured targets were “sufficiently aspirational” and had not evaluated the impact of pupil premium funding. Although teaching, learning and assessment had improved since the last inspection, inspectors found teaching was “not yet consistently good”. Ofsted said pupils’ behaviour needed to improve. Some pupils and parents said the school did not deal with bullying effectively. However, the inspectors did find leadership of the sixth form was good and students made good progress. The quality of pupils’ written work had improved and they received “good quality” careers advice. Additional support had been put in place to help disadvantaged pupils make faster progress. Ofsted made recommendations for improvements, including developing the new behaviour systems.